SICK is one of the leading brands of industrial sensors in the world & is highly regarded as the non-contact sensor technology leader. From factory floor automation to port logistics applications and process control solutions, SICK’s vast array of sensors can solve virtually any sensing application. SICK’s sensors and safety application solutions for industrial use create the perfect basis for reliable and efficient control of processes and for protecting people from accidents. CIMTEC Automation is a Summit distributor partner of SICK, and can recommend the ideal sensor for any sensor application. Our in-house technical support team can help integrate the right sensors into any automation control system to optimize the quality and precision of SICK’s sensor products. SICK offers a wide selection of sensors across many product families. If you are looking for a turnkey approach to your application, CIMTEC can also help create a custom automation solution for you. One of our highly-trained Sales Engineers would be more than happy to consult with you on your application to determine your needs. If you are interested in SICK, contact CIMTEC Automation today! SICK Bar Code Scanners speed up logistics automation – The bar code scanners’ high scanning frequency enables high process speeds. Capacitive Proximity sensors from SICK are ideal for industrial applications that require level and feed monitoring. 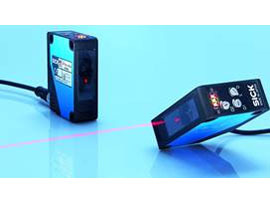 Hand-held Scanners replace the manual entry of data when looking at parts, boxes or containers as they come down an assembly line. Sick’s offering of stationary 2D code scanners can be used in a multitude reading applications. Whether reading 1D or 2D fields, or direct marked codes. Inductive Proximity sensors are in use in millions of applications touching almost every area of factory and logistics automation. SICK sensors provides a wide variety of quality solutions for reliable liquid level and fluid level sensing measurement. Magnetic cylinder sensors are used to detect the position of pistons in pneumatic cylinders, and are attached directly to the cylinder body. SICK offers a comprehensive portfolio of Magnetic proximity sensors in cylindrical (MM) and square (MQ) configurations. Tight on space? That’s not a problem when it comes to integrating SICK's photoelectric sensors into your industrial machine application. SICK's offering of pressure sensors & transmitters is tailored for a wide variety of factory automation solutions. Radio Frequency Identification (RFID) allows identification of an object, even in difficult environmental conditions. Scanners, Light Curtains, Relays, Safety Switches.